Marking Bruce Lee’s only foray into writing and directing, The Way of the Dragon is considered one of kung fu cinema’s all time classics. 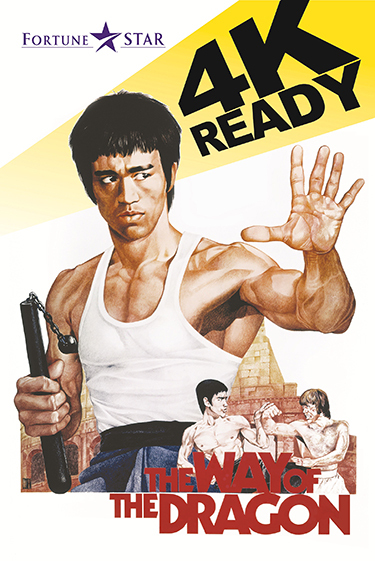 Bruce Lee plays the role of martial artist Tang Lung, who moves to Rome from Hong Kong to assist his cousins with their restaurant business. After being put under pressure by local mobsters to sell their property, Tang Lung must not only adapt to his new and unfamiliar environment, but he must also deal with the constant harassment from a slew of enemies sent after him by the villainous mob boss. With Tang Lung proving to be a worthy opponent, the action culminates in a classic showdown at Rome’s famed Colosseum, against the mob boss’ hired hand, Colt, played by esteemed American martial artist Chuck Norris.